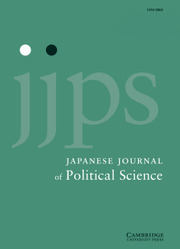 The Japanese Journal of Political Science is a peer-reviewed journal that publishes original theoretical and empirically tested political science research. Manuscripts across the full range of sub-fields and research methodologies are welcome for consideration. We are open to single country or comparative studies, and particularly encourage those manuscripts that draw on interdisciplinary approaches to political science questions. Editors Christina Davis (Harvard University) and Junko Kato (University of Tokyo) commenced their tenure on 1st January 2019. See the full Editorial Transition Statement here.